A new self-portrait of NASA's Curiosity Mars rover shows the vehicle on Vera Rubin Ridge, which it has been investigating for the past several months. Directly behind the rover is the start of a clay-rich slope scientists are eager to begin exploring. In coming weeks, Curiosity will begin to climb this slope. In the image, north is on the left and west is on the right, with Gale Crater's rim on the horizon of both edges. Poking up just behind Curiosity's mast is Mount Sharp, photobombing the robot's selfie. 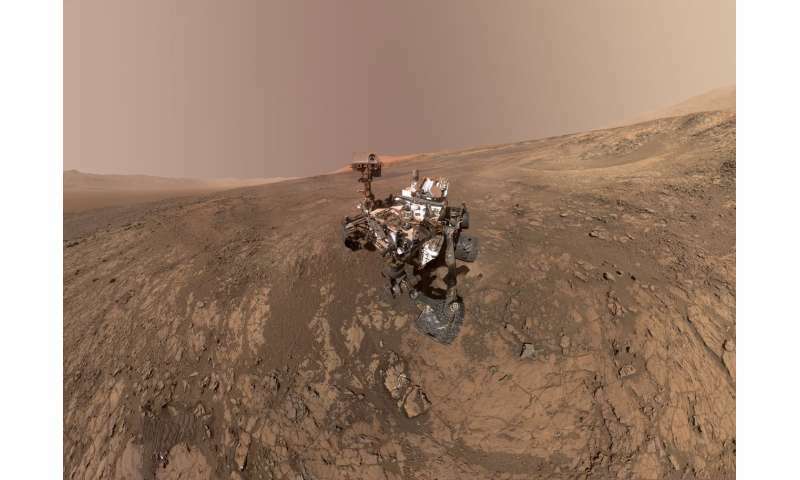 When Curiosity landed on Mars five years ago, the team's intention was to study lower Mount Sharp, where the rover will remain for all of its time on Mars. The mountain's base provides access to layers formed over millions of years. These layers formed in the presence of water—likely due to a lake or lakes where sediments accumulated, which formed these layers inside Gale Crater. The mosaic was assembled from dozens of images taken by Curiosity's Mars Hands Lens Imager (MAHLI). They were all taken on Jan. 23, 2018, during Sol 1943. For news about other Mars missions this month, view the first episode of a new video series, "The Mars Report." In the image, north is on the left and west is on the right, with Gale Crater's rim on the horizon of both edges. Uh....is that even possible, in geodesic terms? Or even photomosaic ones? If I stand on my head, I can do it. What about all the holes in the wheels? They look damaged, are they? I dunno instead of asking people here to work Google for you, why don't you do it yourself? OK, thanks for the informative reply. You probably figured it out, but it's a wide-angle shot so: it starts at North on the left sweeps through East and south to end up at West on the right. Edit play with Roundme it is fantastic.